SXSW EDU (South by Southwest Education), takes place March 4-7, 2019, just prior to SXSW. Education visionaries, industry leaders, and change-makers converge at SXSW EDU to explore the future of teaching and learning. We’re excited to offer early SXSW arrivals the opportunity to enjoy access to SXSW EDU for a series of summits on Thursday, March 7, rooted in education, with broader appeal to tech and business leaders. Issues surrounding the talent pipeline and cities of learning will be addressed by mayors, a university president, and education leaders from across the country. SXSW Platinum, Interactive, Film, and Music badges can be picked up at the Austin Convention Center in Ballroom B (at the corner of Cesar Chavez Street and Red River Street) as early as Wednesday, March 6. Get your badge early to avoid the crowd and attend to any of the SXSW EDU summits highlighted below. What actions should be taken to ensure every child and community thrives in the face of rapid change? This panel will explore forces of change shaping the future and will consider zones of innovation that can be leveraged to help prepare learners and communities for what’s next. Participants will hear from funders and implementors who are responding to and leveraging changes on the horizon to catalyze and sustain education innovation from the community to the classroom level. Local leaders recognize that if they don’t attend to youth outcomes, their cities have little chance of success economically, socially, or civically. Hear from mayors that are taking up the mantle to change the odds for youth in order to increase social mobility in their communities, a Denver demo on how to move systems into the 21st Century, and ideate with participants on coordinating people, using data to drive decisions, and making smart investments in children and youth. The future of work is changing. As the skills needed for new jobs being created by new technology evolve, we’re living longer and working longer. There are now more people in the U.S. over 50 than there are under 18. 63% of adults 60-64 still work, 40% of adults 65-69 still work. How do we tap into this talent pool and re-skill the greying workforce for the rapidly-changing nature of work for their benefit – how do we give them meaningful, purpose-driven jobs – and for the benefit of society? Corporations play a central role in talent development and lifelong learning. Join us as we look under the hood at innovative development programs that help workers learn and advance in a changing labor economy. Explore how leading companies set strategy, fund the work, coordinate with regional partners, and leverage cutting-edge technology to drive impact. We’ll also discuss how these investments benefit more than just workers — they benefit businesses, communities, and the economy at large. The Healthcare Workforce Alliance of Central Texas is a community-sponsored and industry and education led group that exists to collectively address the workforce needs of the healthcare industry in Central Texas. Join representative members to access lessons learned in both policy and practice as they work to solve systemic talent pipeline challenges for entry- and career-level healthcare workers in the area. 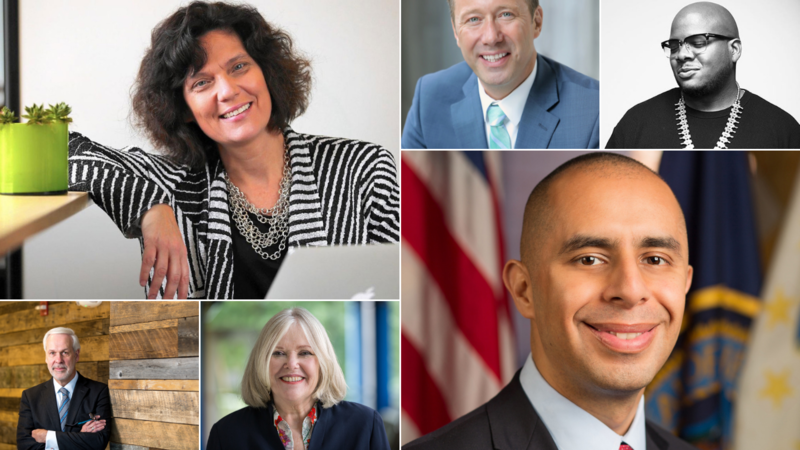 SXSW EDU 2019 speakers (t-b, l-r) Connie Yowell, ayor Shane Bemis, Rob English, Paul LeBlanc, Jane Oates, and Mayor Jorge Elorza. Get Inspired by smart at SXSW!